Microscan Vision Solution holds one of the world’s most robust patent portfolios for machine vision systems technology, including hardware design, software algorithms and machine vision illumination. Our Visionscape® brand of machine vision hardware and software is an industry pioneer, improving automated technical inspection, gauging and measurement capability to the benefit of manufacturers worldwide. 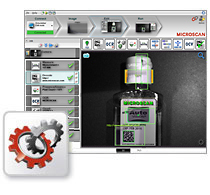 Microscan is in continual development of our Visionscape hardware and software as well as our NERLITE® machine vision lightingproducts, to ensure we provide cutting edge technology and the most complete offerings for machine vision applications.